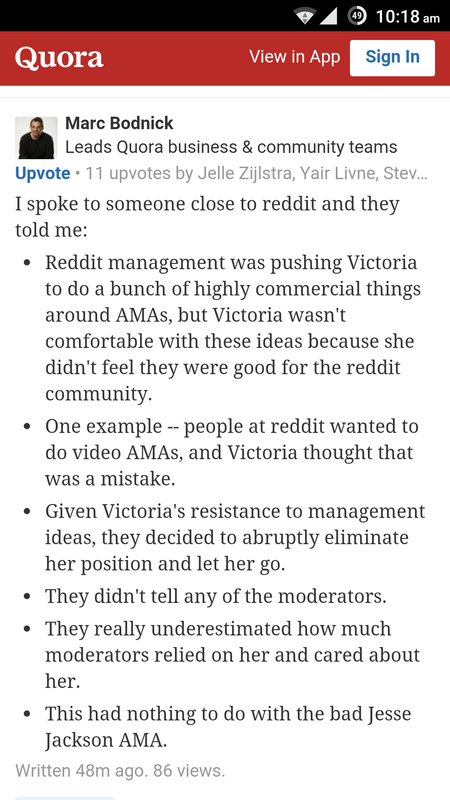 Major sections of Reddit, including its famed Ask Me Anything (AMA) subreddit, have gone dark after the dismissal of talent director Victoria Taylor (better known as /u/chooter). Taylor was responsible for organizing, scheduling and often physically being present to transcribe AMA sessions with the likes of US President Barack Obama, Julian Assange, Amy Poehler and others. After she was let go, the moderators of the r/iAmA subreddit took it private to figure out how to handle their roster of upcoming AMAs without Taylor’s help. That effectively shut out other users from the subreddit entirely. There should have been a transition in place or something worked out to ensure that Victoria’s duties would be adequately handled, which they are not) We had a number of AMAs scheduled for today that Victoria was supposed to help with, and they are all left absolutely high and dry (hence taking IAMA private to figure out the situation) (sic) She was still willing to help them today (before the sub was shut down, of course) even without being paid or required to do so. Just a sign of how much she is committed to what she does. The admins didn’t realize how much we rely on Victoria. Other key subreddits like /r/AskReddit, /r/science, /r/gaming, /r/history, /r/Art, and /r/movies have also closed their doors for the time being, to show solidarity. It’s not clear just how long the standoff will last. AMAs are a big deal for Reddit; the company recently launched an app on iOS and Android to let users follow the immensely popular sessions — and there still isn’t an official Android app for the site yet. Responding to a question about Taylor’s dismissal on Quora, Marc Bodnik, who leads Quora’s business and community teams, said that he was told by “someone close to Reddit” that the site’s management was pushing Taylor to take the AMAs in a more commercial direction, and she wasn’t comfortable with the idea because it wouldn’t do the Reddit community any good. Apparently, video AMAs were proposed and Taylor thought that would be a mistake. Bodnik has since deleted his answer on Quora. 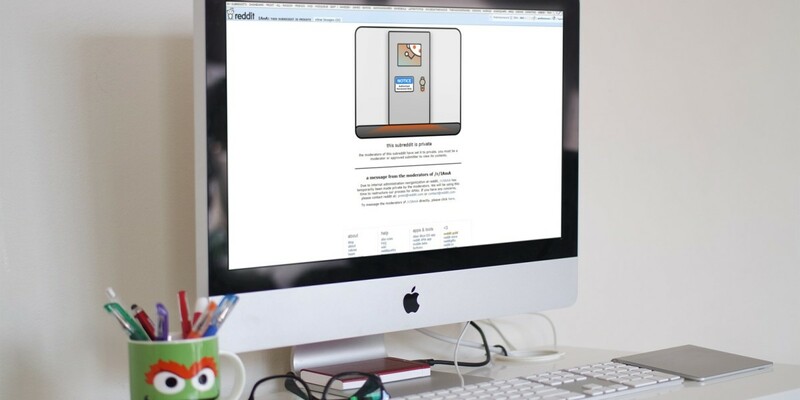 Reddit, which is owned by media giant Condé Nast, has nearly 164 million monthly users and close to 10,000 communities. The site celebrated its 10th anniversary last week. We’ve contacted Reddit to find out more and will update this post when we hear back. Update 2: Update: Reddit co-founder and chairman Alexis Ohanian has released a statement over on /r/modtalk, a group for moderators of large subreddits with more than 25,000 subscribers. Ohanian apologized for failing to inform moderators in a timely manner about dismissing Taylor. He added that Reddit will dedicate resources to help with AMAs and has appointed community manager Kristine Fasnacht, who goes by /u/krispykrackers, as the point of contact for moderator issues. The bigger problem is that we haven’t helped our moderators with better support after many years of promising to do so. We do value moderators; they allow reddit to function and they allow each subreddit to be unique and to appeal to different communities. This year, we have started building better tools for moderators and for admins to help keep subreddits and reddit awesome, but our infrastructure is monolithic, and it is going to take some time. We hired someone to product manage it, and we moved an engineer to help work on it. We hired 5 more people for our community team in total to work with both the community and moderators. We are also making changes to reddit.com, adding new features like better search and building mobile web, but our testing plan needs improvement. As a result, we are breaking some of the ways moderators moderate. We are going to figure this out and fix it.